The group show “Interior” is a superb and evocative meditation on its title subject and on styles of realism that also welcomes the artist-designer Roy McMakin to the gallery. It has been organized by Barry Rosen, an independent curator and friend of Mr. McMakin’s, and is drawn almost entirely from artists represented by Tibor de Nagy, which hasn't cramped its style. The interiors under consideration include rooms, houses, hearts and minds. There are interiors and rooms and still lifes by Nell Blaine, Jess, Jane Freilicher and Manny Farber, and fictional postage stamps featuring ornate buildings and homey vegetables by Donald Evans. Two typically spare paintings by Biala look through windows to the world outside, as do two photographs by Rudy Burckhardt. 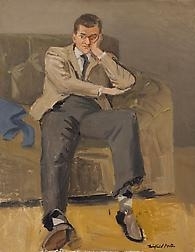 Fairfield Porter’s arresting if tweedy portrait of John Ashbery from around 1952, which has not been exhibited in decades, shows the young poet slumped pensively on a sofa. And Joe Brainard’s ineffably touching homage to his lover Keith McDermott in the form of 10 pale collages must be among the best things he ever made. A large group of Mr. McMakin’s delicate pencil drawings shows him tweaking furniture forms, explaining himself in captions, while revealing a debt to the work of Richard Artschwager and Robert Gober and a reservoir of feeling that may help him overcome it. They also indicate a penchant for a distinctive, high-energy form of wood grain.